She also thanked me for taking her and her brothers to Yabun 2017. She is aware that she experienced something significant. A proud celebration of the First Australians and what it means to be strong in the face of great adversity. And significant and strong Yabun 2017 was. The music, the stalls, the dancers and the food. Performers like Terra Firma, Vic Simms, Marlene Cummins, Kev Carmody and headliners Salt Lake Band from Umbakumba on Groote Eyalndt – amazing musicians and singers. Vic Simms had the crowd up and dancing as he sang energetic covers of “Jumping Jack Flash” and “Coo Coo Ca Choo”. The main stage was definitely showcasing music to a beat. The market stalls were bustling and exciting. All three of my kids received wonderful henna tattoos. I bought a black, yellow and red umbrella. We feasted on smoothie bowls, chicken burgers and chips, waffles and ice cream. The queue at the bush tucker stall never seemed to diminish. We picked up fliers at the YARN Australia stand. The children encouraged us to register with Sea of Hands. We watched with wonder at the Corroboree Ground dancers. We listened with respect at the Speak Out Tent. We made new friends with some beautiful aunties at the Elders’ Tent. We learnt a fantastic song about Tommy the Termite at the Jarjums Zone (thanks to Uncle Col Hardy). When asked to explain what we were celebrating at Yabun, my five-year-old replied “that the Aborigines were here before us”. 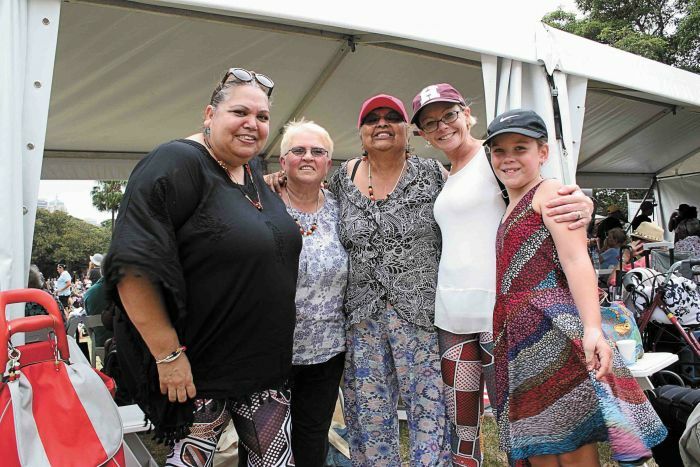 Yabun was a wonderful celebration of Indigenous culture, heritage, art and music. See you there next year.